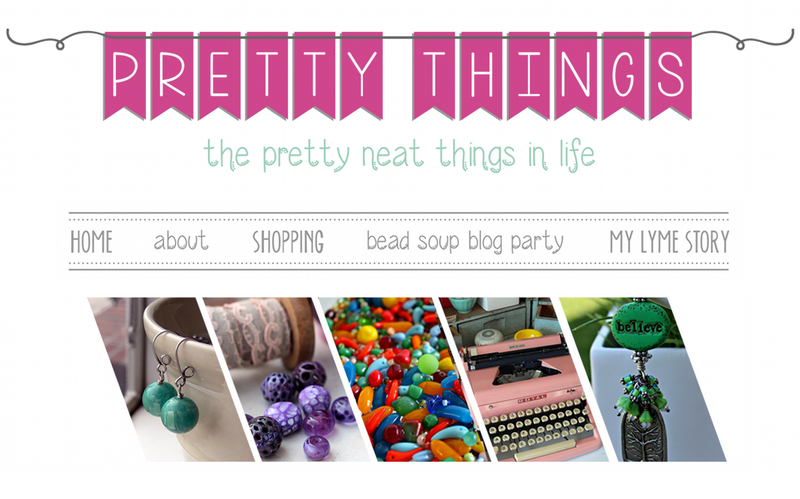 Pretty Things: Win free lucite beads! I have a very simple earring tutorial in the current issue of BeadStyle magazine, and now you can win a goodie bag of lucite beads, including the beads to make these earrings! So leave a comment (with an email if you don't have a blog you're linked to)! For extra chances, post this on your blog, Twitter, and/or Facebook. If you'd like to become a follower, I'd be honored. I'll draw a name a week from now, August 10th, so be sure to check back -- mark your calendars now! 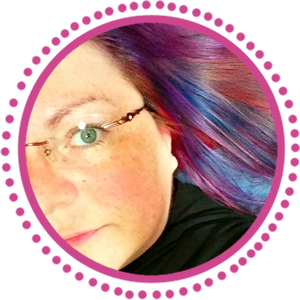 Lori Anderson makes jewelry for Lori Anderson Designs and also writes the blog An Artist's Year Off. She lives in Maryland. Beautiful! Thank you for hosting this giveaway, Lori! Very pretty earrings! Would love to win the beads! ooh I would love to win these! My beads are looking a little thin lately and I'd love to try out some lucite! I haven't tried working with lucite flowers before, but I love the look, so would be cool to win! i am a follower- thanks for the opportunity! Oooh...a giveaway! Love it! This also reminds me that my copy of the magazine hasn't arrived yet...hmmm...I'll have to go in search of it. Cute earrings, congratulations on having them published. I also put this on Twitter. These earrings are to die for! I would love to win although I shouldn't enter because I have already won a creation of yours but......I want them!!!!!! I'm already a follower. 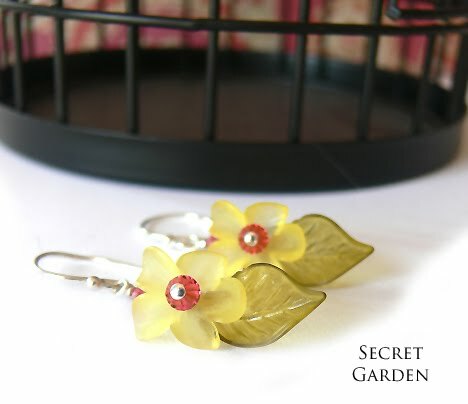 These earrings are so pretty and delicate in lucite. Congrats on the publication. Love your blog, love your artistry & love these earrings! Thanks so much for the chance to win some lucite beads. I've wanted to try working with them for ever-so-long. Congrat's on being in the magazine, and I adore those earrings! Isn't it funny how we are drawn to the opposite sometimes of what we do ourselves! I would love a chance to win, I have NEVER used lucite beads before! Very pretty!!!! I would like to participate. I'll post the link on my blog. I'll put it on my blog! I love the daintiness of them. Great BeadStyle article - congrats! Thanks for having a contest too! I'm a follower! Lovely earrings and I love playing with Lucite! Oh! And I am a follower! Your evening emails are wonderful end to the day! Oh my they are the sweetest things I have seen in a long time. I have never worked with lucite before so I'd love to win these goodies. Thanks for such a beautiful giveaway. I have also posted your giveaway on my blog! 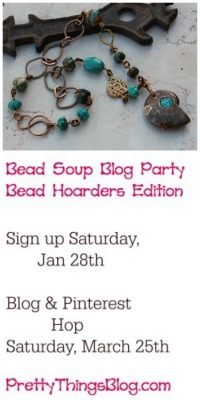 Hi Lori, what a awesome giveaway and congratulations for your feature in Beadstyle. I would love to win your giveaway please enter me, I hope it is open to Canadians. Lori - loved your designs in the mag - just awesome - would love to win some lucite too to try making some too! These earrings are sooooo very romantic and pretty. Can't wait to see this tutorial in print...this looks like a fantastic issue! Congrats, Lori! Oooh, pretty earrings! I love lucite flowers. I'm already a blog follower and I'll try and blog about it later when I'm home from work. Thanks for being so generous! Thanks Lori. This is a wonderful giveaway!! thanks for the opportunity and congratulations on your feature tutorial! May it bring you even more success. I saw those earrings in the mag...I knew they were yours. I think they were my favorite project in the whole magazine! Thanks for the stream of inspiration from your blog, even when you are not feeling inspired! Would love those beads! I haven't worked much with lucite but I love it! Now I'm off to give a mention on FB and Twitter. Thanks!!! Your Lucite earrings area beautiful. I would love to win them. I will Facebook and twitter your link. And I have blogged about it. Have always wanted to work with lucite like these. Kicking said self in rear for not buying all the leaves and things I found at one of the booths at Bead & Button. I'm really in the mood to win something . . .thanks for the chance! The earrings are lovely. Oh my gosh, who wouldn't love these beads!? Awesome earrings. Ooh, beautiful! I'm already a follower, but I'll put your giveaway on my blog for that extra chance! I just came over from Beadwright and really think I have to become a follower of your blog. Cute earrings btw! Left you something on my blog! Fabulous earrings! 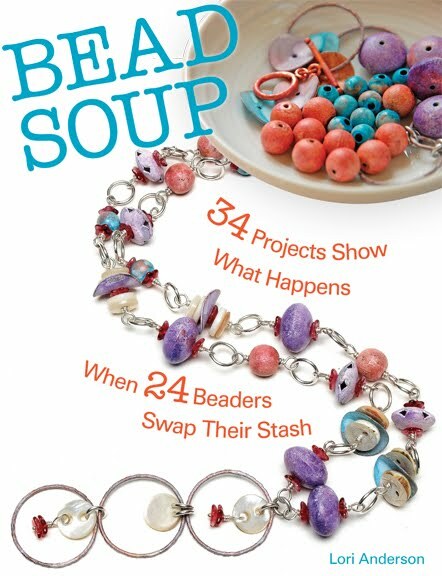 I haven't had a chance to check out this issue of BeadStyle but I'll be sure to pick it up. I do not have any lucite beads - believe it or not. Would love those. So pick me. I follow you for sure. These lucite beads are just what I need to jump out of the box. Love to follow your blog. I love those earring, they are just so pretty and fancy fun! Love the earrings Lori! Thanks for the opportunity to win. Count me in, i love a giveaway, i'm already a follower of your blog, i have a giveaway on at the moment aswell if you want to enter mine feel free. So pretty... especially for summer. Love working with lucite! Congratulations on your tutorial! Excellent earrings! Thanks for hosting a giveaway.